For patients with more than one missing tooth, the challenges can be difficult and threatening to not only your oral health, but your general health as well. First, there is the embarrassment patients may feel when they speak, smile, or laugh—others certainly see the gaping hole or holes in your smile. Then, there is the fact that many people who are missing several teeth are actually malnourished because they cannot maintain a healthy and varied diet that includes fresh fruits and vegetables. Finally, a person’s self-confidence and self-esteem often suffer as a result of missing teeth. Fortunately, Dr. Olberding offers dental implants, a lifelike solution for people with one or more missing teeth. Whether you have lost teeth because of periodontal disease (the #1 reason for tooth loss among adults in the United States), traumatic injury, extensive decay, or a congenital defect, dental implants can restore your health and your smile. A dental implant is a small titanium post that is surgically set in your jawbone. This post becomes the “root” of your new tooth. Dr. Olberding works closely with several Lincoln area oral surgeons to ensure that your implant is properly placed. As you heal from this surgery, the post and surrounding bone tissue fuse together and develop a symbiotic relationship. The bone firmly holds the post and the post stimulates healthy new bone growth. After several months of healing, you’ll return to our office where Dr. Olberding will attach the appropriate tooth restoration. 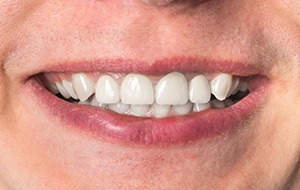 A partial is a prosthetic device that is designed to fit much like a puzzle piece between and among your existing teeth. 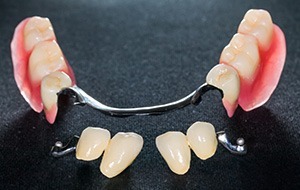 This prosthesis can be held in place with clasps that attach to the teeth around your missing teeth. However, a much more secure option is a dental implant, which firmly connects to the underside of a partial. 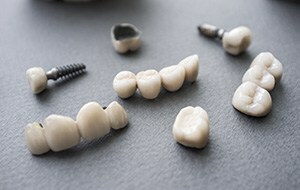 For patients who are edentulous, meaning they’ve lost all of the teeth along one or both arches, Olberding Dental offers implant-supported dentures. As the name suggests, these dentures are secured to a number of dental implants that the oral surgeon strategically positions along your jaw. A precision-milled titanium bar mounted to the underside of the denture solidly fastens to the implants. To replace missing teeth with a crown and bridge, crowns are normally placed on top of adjacent teeth to anchor the bridge in place. However, if those nearby teeth are not strong enough to support a crown, then a dental implant can be used. 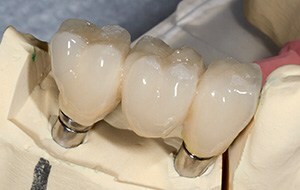 A custom-crafted porcelain crown is then attached to the implant. If you have been considering dental implants for multiple teeth, we invite you to call us to schedule an appointment with our Lincoln dentist. Whether you’re looking for general, cosmetic, or restorative care, you can count on our team to provide service that exceeds your expectations. We will help you get to the root of your oral health problems so you can enjoy better comfort and functionality.